If you’ve been considering going back to school for your Master of Business Administration (MBA)…Spring 2019 couldn’t be a better time to begin this new journey. If you’re not currently admitted, you can apply here and begin the application process. Deadline for Spring 2019 MBA admission is December 15, 2018. Proof of financial need is predicated upon current 2018-2019 FAFSA application that shows student meet criteria for federal financial aid. Requirements are evaluated by the University’s Financial Aid office. 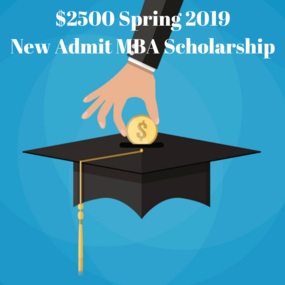 If you have any questions about the $2,500 Spring 2019 New Admit Scholarships, please contact the Marilyn Davies College of Business Graduate office at 713-221-8252 or email mba@uhd.edu.